In the late 1980s and early nineties, Dann Nardi enjoyed a burgeoning art career in Chicago. His cast-concrete and shaped-wood sculptures were exhibited alongside Anne Wilson’s at the Cultural Center, in group shows at Paul Klein’s gallery, and in several solo shows at Roy Boyd Gallery. Following an economic recession in the eighties, the difficulties of making a living as a working artist disenchanted Nardi, and he dropped out of the game. “I stepped out of being visible,” he says, but continued making sculptures in his studio in Normal, Illinois, a rural college town. He sought, and won, several public-sculpture commissions outdoors, away from white-cube galleries (they are “too quiet,” he says). Now, fifteen years later, Nardi has reemerged in Chicago with a survey of works from 1988-2010 installed in the lobbies of the Willis Tower. The seventeen sculptures on view draw from, simplify and distort forms found in nature—trees, spirals, the body—similar to the way that Martin Puryear warps nature into something graceful and strange. Most of Nardi’s works are scaled to the body, likely because he works alone in his studio, without the help of assistants or fabricators. They are as big as he can stack and lift them, and this guides a relational viewing encounter. The life-sized sculptures draw people toward them, and the contours invite a tangible, feelingful experience. “Nearly all my work is meant to be touched,” says Nardi, pointing to the fingerprint-stained copper leaf lined inside “Cusp,” a loop of wood that illusionistically glows from within. Organized by Nixon Art Associates, the exhibition of sculptures inside the Willis Tower harmonizes with the massive and unique architectural setting and the throngs of tourists and office workers that daily bristle through these lobbies. Nardi, who now sees himself as a public artist, enjoys this context. Here, people who don’t normally seek out art are confronted with it. The Willis Tower’s west lobby is also home to a monolithic Calder sculptural installation. Titled “Universe,” from 1974, gigantic pieces of painted metal rotate and spin hypnotically. 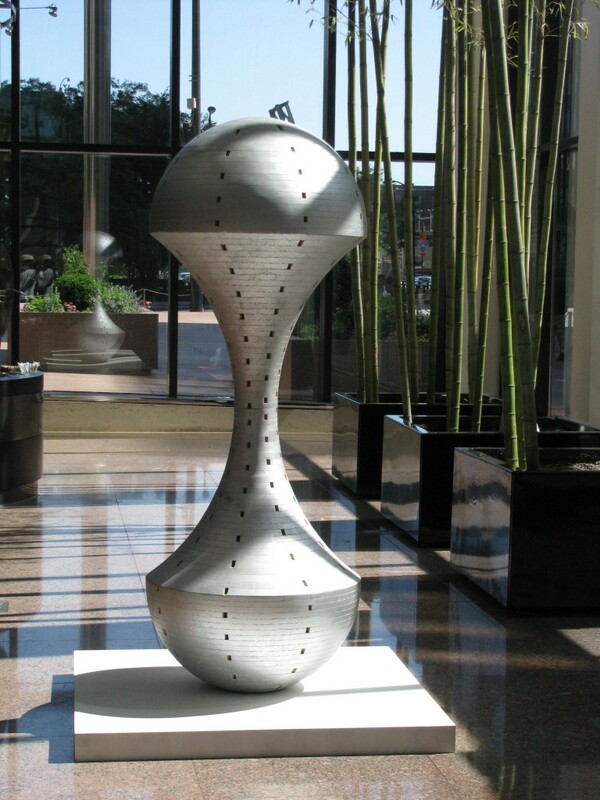 Time and again, Chicago’s corporate lobbies prove to be an unlikely place to see stellar pieces of art, and Nardi’s works are well-sited in such a context. As he looks across the expansive, light-drenched atrium, Nardi notices “shared properties” among his works, several of which are distanced by decades, yet joined by a continuum of form. He has an affinity for vortex or vessel shapes, and trellises. These works have never been shown together, and many were in storage for the past fifteen years. Reflecting on his break with the art world, Nardi says, “I still don’t know if that was the right decision,” and yet here he is, his work likely getting more crowd exposure than any other current show in Chicago. It’s an impressive and welcome return.